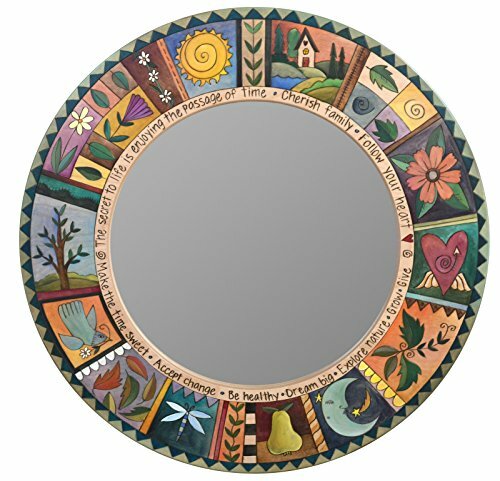 Created by Sticks - Object Art & Furniture Standard Circle 36" diameter Mirror MIR012 Wood & glass - 1.75"D 36" diameter Sticks was started by Sarah Grant in 1992. Since then, Sticks has received national acclaim for their distinctive line of furniture, accessories and object art. The company began by designing smaller items such as ornaments and candlesticks, and has evolved to feature larger items such as dining sets, beds and armoires. Each piece is handcrafted within Sticks' award winning studio. All pieces are finely crafted from birch, poplar and driftwood. The pieces are further designed with hand drawn imagery, etched contouring and vibrantly blended paint. Pieces can be embellished with 3-D wood components, metal, leather and fabric. Sticks is constantly evolving due to the imagination of their design team and the many talented craft artisans that they employ. If you have any questions about this product by Sticks, contact us by completing and submitting the form below. If you are looking for a specif part number, please include it with your message.